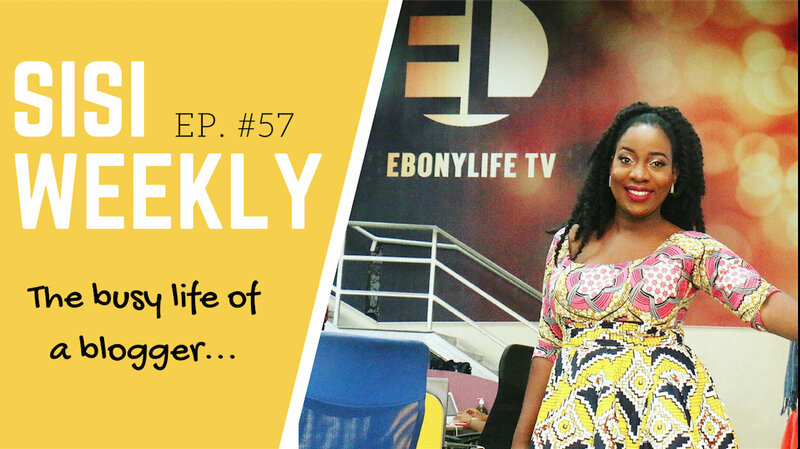 LIFE IN LAGOS : SISI WEEKLY EP #57 "THE BUSY LIFE OF A BLOGGER"
Hallo! Last week I had an interview with EbonyLifeTV, it will be aired in the next coming weeks/months. CNN Next? LOL. You never really know.... I also attended Intel's "I Am Powerful " event, it resonated with me because I pretty much have my career on the internet via a computer. We ended the week with a birthday party which was so much fun! Something interesting has been happening to me, it's meeting so many people who watch my vlogs, the interesting thing is these are people from "the abroad". I have more "abroad" viewers than in Nigeria where I live and i guess it's because a lot of them are homesick so they live vicariously through my vlogs... Nice to meet you all! Thank you so much Tosan! My five year old just saw me watching this and she was like, "Mummy who's that? Sisi?" I'm sure if she sees you in real life she'll recognise you. That print on print outfit looks so good on you! Olorisupergal be rocking with her big hair. I can't wait to see how far this blog takes you. The future is definitely bright! Congrats on the EbonyLifeTV feature! Thank you so much Precious-I love your girl already!!! LOL. One day we will meet! Olorisupergal looks fab in that hair.im going to copy it. So sad I missed my interview with them early this year. I live in the UK and couldn't come down to Nigeria. That party is the real definition of party,both the young and old had fun.Tito looking more matured in every episode.How is uncle Junior?Its being long we see him here.Keep soaring high Sisi. That was what I loved about the party, it was for everyone! Uncle Junior went to school oh, he'll soon be back! Sisi, your vlogs lights up my world. God bless you and your Wonderful Family. Wow! That makes me so happy! Thank you so much for always watching! tito's face during d hair cut is so epic lol,d seriousness nd all, he is growing up to b a fine young boy!i always look forward 2 ur vlogs,keep it up sisyemmie,God bless u. He looked like he was not impressed with the style i chose for him a all. LOL. Thank you so much for watching! Aww... The birthday u went for was Osaretin's son? She was my classmate in Uni. I'm definitely getting my Adekunle Gold CD on my way home today! Whoa that's power of belive and consistence on what you have passion for. Go Sisi! I have sent you an email on sisi@sisiyemmie.com. I know you are very busy but I will really appreciate your prompt reply. Go sis!